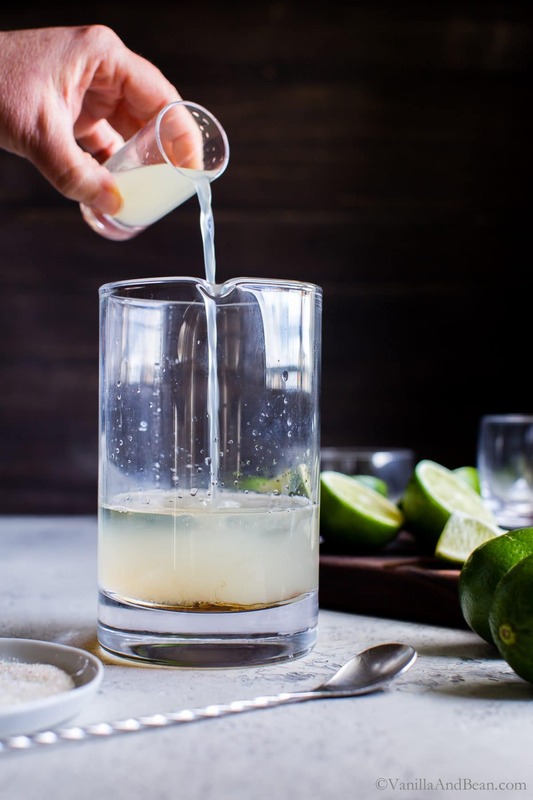 Salty, tart, slightly smoky and sweet with a bit of fizz: a fresh margarita – Mezcal Margarita Fizz comes together quick and is fabulous served alongside your favorite Mexican food. Having just returned from vacation in Costa Rica, I did indulge in happy hour fresh margaritas. I reserved those for the few afternoons spent lounging by the pool. I didn’t overdo it though. I wanted to preserve my energy for other pursuits like paddling down the Rio Frio and hiking in the jungle looking for birds, sloths, bats, caiman, and monkeys. We found all of them and more! The food, culture, wildlife and beauty of this rugged country captured our hearts. What a dream! Have you been? I’ve more to share about the trip in a few upcoming posts, but until then, let’s talk margaritas! It’s #MargaritaWeek after all! 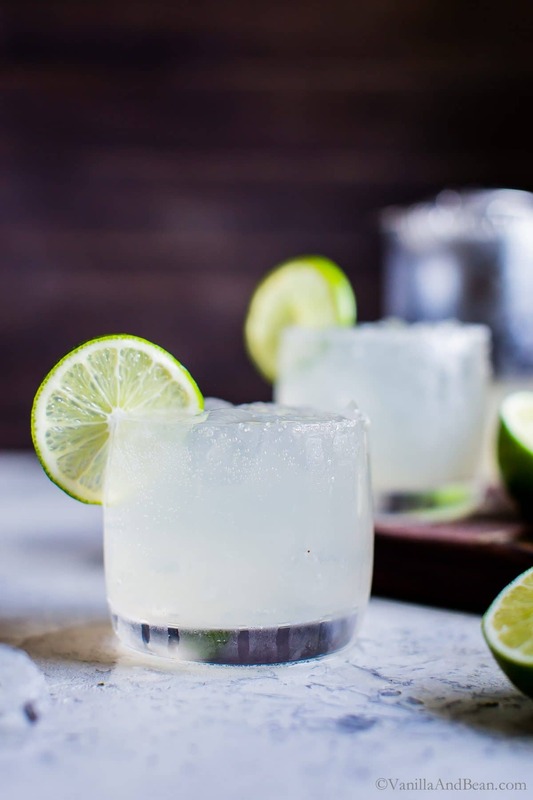 Kate, the creator of the blog !Hola Jalapeño, rounded up a ton of bloggers to celebrate the humble margarita just before Cinco de Mayo and you’re going to love all the creative ways shared on her #MargaritaWeek page. For this fresh Mezcal Margarita Fizz, I kept it basic. In it’s simplicity, Mezcal is a special tequila with smoky notes derived by the way Mezcal is crafted. In part, the process of roasting agave hearts, the piñas, with mesquite wood yields a unique smoky characteristic in this spirit. But because it’s only a part of this cocktail, the smoky flavors are sublimely subtle. Since I love fizzy libations, I topped this margarita with a bit of bubbly club soda. Add simple syrup to taste or none at all (recipe in notes). Agave nectar may be used instead of simple. Fresh lime is a must in homemade margaritas! 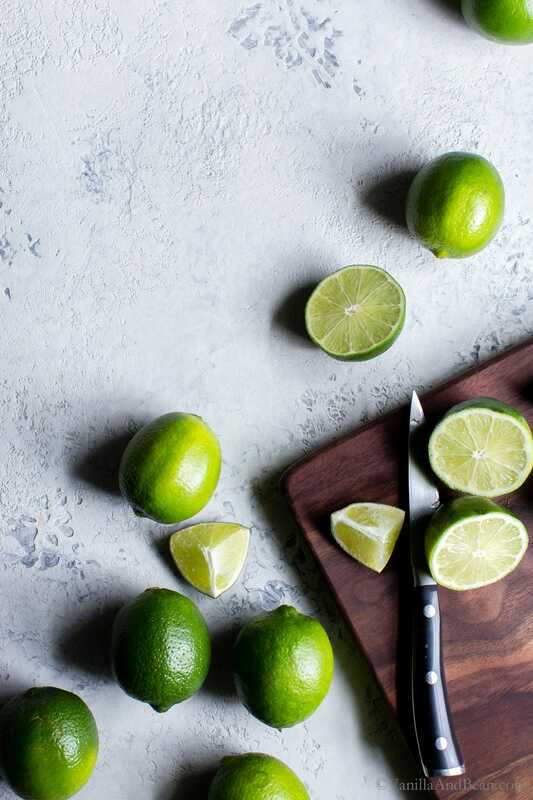 Before squeezing the juice, roll the lime on the kitchen counter to loosen up the juices. To make ahead or for a larger batch, mix all the ingredients except the club soda and ice. Store in a lidded jar in the refrigerator until ready for use. 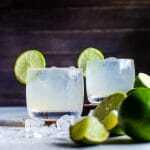 When ready to serve, prepare glasses, lime garnish, pour into ice filled glasses then top with club soda. For more fresh margarita inspiration, be sure to head over to Kate’s !Holajalapeño #MargaritaWeek page. 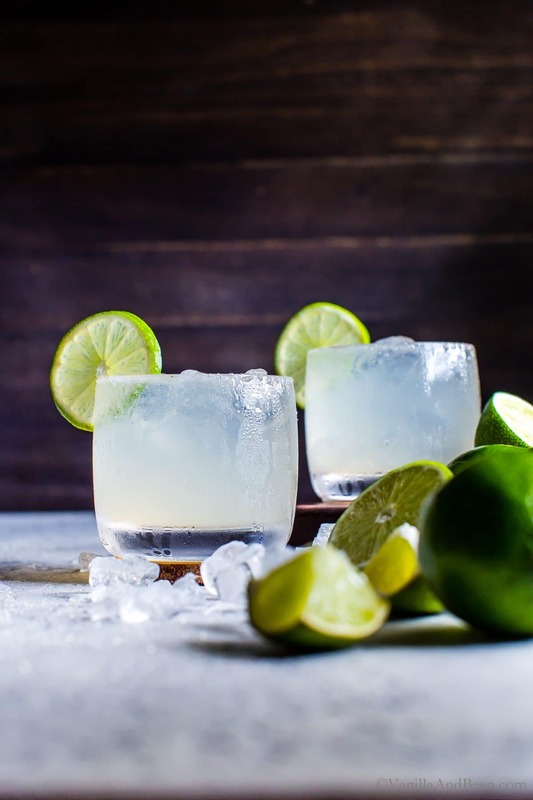 Salty, tart, slightly smoky, subtly sweet with a bit of fizz: Mezcal Margarita Fizz comes together quick and is fabulous served along side your favorite Mexican food. To a cocktail shaker or cocktail mixing glass add the tequila, mezcal, cointreau, lime juice, and simple (if using). Top with ice and stir/shake. Taste for simple adjustment. For the rim, mix the sea salt and cane sugar together in a small shallow dish. Rim a low-ball glass with lime, then dip into salt/sugar mixture. Fill the glass with ice and strain the cocktail mixture into the glass. Top with club soda and garnish with lime wheel. *Homemade Simple Syrup: Bring equal parts sugar and water to a boil (1/4 C each) and simmer until all the sugar is dissolved. Pour into a storage container and refrigerate until ready to use. Subscribe to Vanilla And Bean's Sweets and Savory Weekly Vegetarian Recipes Email List (It's Free!). Mezcal is really magical – I love the smoky mystery of it. This drink looks simply delicious! This looks like a beautiful drink and your photos are spectacular. I have had a long aversion to tequila and mezcal (probably due to my twenties), but have since rediscovered them. I will have to try this! Thank you so much, Ben. I just rediscovered tequila (and Mezcal is newish to me) because of those 20s lol! I hope you enjoy the recipe! Holy cannoli am I jealous. I absolutely adore sloths & would love to see one in the wild. The Mr. & I had planned a trip to Costa Rica many moons ago but we bought a house & decided to postpone the trip. Other trips, including our move to Africa, always seemed to take priority after that. As for this margarita. . . well. . .it looks utterly irresistible Traci. And the frosty glass just puts it over-the-top for me. Oh Lynn… buying a house is big and all the expenses associated with it. There are so many travel options, we suffered from analysis paralysis for so long – lol – and just finally made the decision to go! I can’t wait to go back. I hope you enjoy the margarita! You lucky girl! I can’t wait to hear all the details of your vacation. It’s NOT a vacation without a classic margarita! This one looks perfect. Right? A spicy margarita! Thank you Karen! The monkey’s OMGeee too.. so incredible to see them on their terms – pure wild and so inspiring! Oh yes, that club… you know how I love fizzy drinks? Well I just had to give it a go in a margarita! I hope you enjoy it, Geraldine! Best dang week of the year! And the perfect kick-off to Summer! Love these simple cocktails. And can’t wait to hear more about your trip. I haven’t been, but it always seems so lush and inviting. I need to make the trek someday for sure! Right? SO much goodness and inspiration! I don’t know what I’ll make next! Oooo, put Costa Rica on your list, Liz… It’s an amazing place. Whoa, your photography is stunning! I love it! And this drink recipe looks bonker delicious! Thank you so much, Christina! Sounds like you had a wonderful vacation in Costa Rica Traci! It’s on my bucket list. I can’t wait to hear all the details! Loving this tasty margarita for Cinso de Mayo. I knew you’d be sharing something fabulous! I’ll be adding this one to our cocktail menu for sure. Happy weekend! Thank you Codrut! He’s a mezcal fan, no? We waited too long, Kankana… I mean, why didn’t we do this years ago? We loved traveling in the less crowded off season. The little bit more rain wasn’t a bother at all and rates were better! I hope you enjoy the fizz…. I’m a fan too! 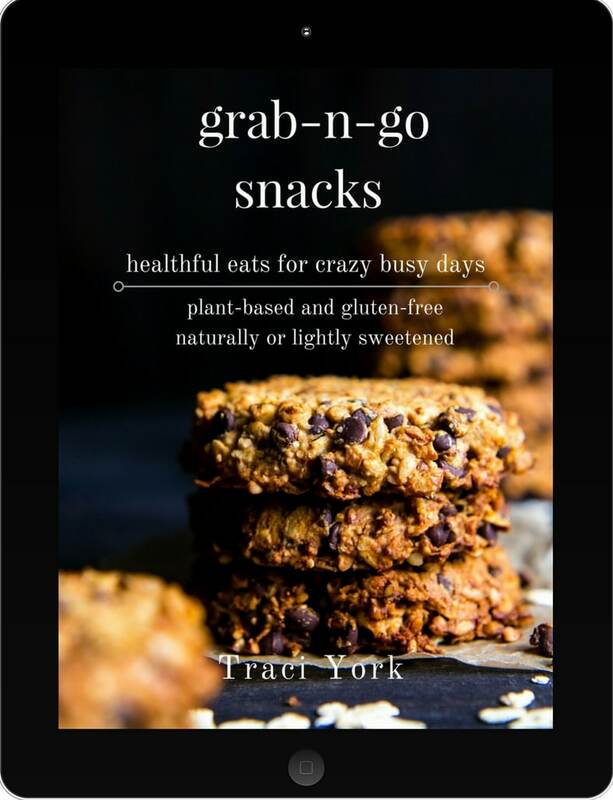 Have You Checked out My Ebook? © Vanilla And Bean – 2018. Unauthorized use and/or duplication of any content or images without express and written permission from this blog’s owner is prohibited. Licensing inquiries for publication, general distribution, and/or commercial use, please contact me on my contact page. Vanilla And Bean is monetized in part through the use of affiliate links. 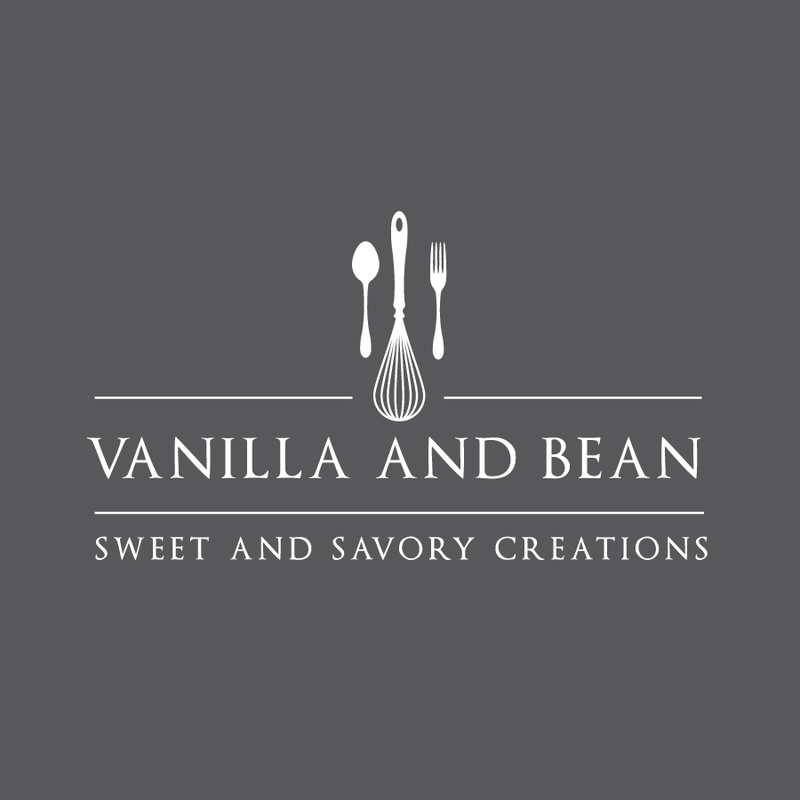 This means that if you were to click on a link and/or purchase an item after clicking on a link, Vanilla And Bean may receive a percentage of the sales price. I only recommend products that I love and use through my affiliate links. Thank you for your support! Join over 4500 Subscribers in the Vanilla And Bean community to receive free weekly vegetarian, vegan and sweets recipe inspiration delivered right to your inbox!